Weird Horror Manga | Who Killed Orrin Grey? I-don’t-know-how-long ago, Jesse Bullington suggested to me that I check out some manga by Junji Ito. Much to my chagrin, it took me until now to do it. More’s the pity, as it turns out that Jesse was (unsurprisingly) absolutely right: Junji Ito is a genius. What is there to say about Junji Ito, really. As of the time I write this, I’ve read almost everything of his that’s been officially translated into English (and a couple of things that were unofficially scanlated, I admit). I’m still waiting for the second volume of Gyo. And I already want more. I promise that I’m not engaging in my trademark hyperbole when I say that Junji Ito is one of the most consistently brilliant creators–in any medium–I’ve ever encountered. His two most famous series–Tomie and Uzumaki–are both actually sequences of short stories that stand variously well on their own. The majority of the Tomie stories could probably be read entirely out of context and enjoyed just fine, though there’s the occasional continuity between a couple of tales, but when they’re read all together (as they’re currently collected in the first two volumes of the Museum of Terror) they create a kind of mythology, a building sense of dread that’s at once claustrophobic and yet immense (yes, even cosmic) in scope. It’s an approach that he’d perfect in his Uzumaki saga. To describe the plots of any of Junji Ito’s stories are to miss the point of them, largely. He’s a creator whose work succeeds mostly on the level of atmosphere, of pacing, of sudden reveals and potent images. 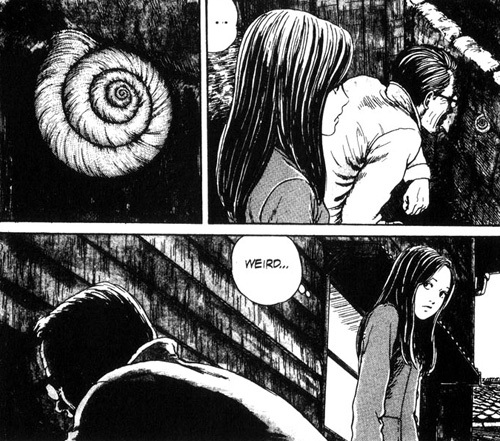 Uzumaki, for instance, tells the story of a town obsessed with spirals, but it’s so much more than that. Junji Ito cites Lovecraft as one of his influences, and Uzumaki is often credited as a Lovecraftian work, but, again, it’s much more than that. Like Laird Barron or Thomas Ligotti (to name a couple), Junji Ito starts from a position of Lovecraftian cosmic terror, but uses that influence to create something wholly and uniquely his own. Viewed in the context of Ito’s other works, Uzumaki feels less like an homage to Lovecraft, and more simply the culmination of Ito’s own unique vision. Whatever it is, it’s a true modern masterpiece of weird fiction, of a type and scale that’s rare and breathtaking. As I said near the beginning of this post, Junji Ito is a genius, and Uzumaki is his masterpiece. I’d recommend all of his work about as highly as I can recommend anything, but Uzumaki is pretty much required reading for anyone with an interest in weird horror. As I said before, Kazuo Umezu is one of Junji Ito’s claimed influences, and is considered the “godfather of horror manga,” according to the Internet. Unlike with Ito, I haven’t read nearly all of Umezu’s output, but I’ve read quite a bit, starting with the first volume of his Cat-Eyed Boy series (the second volume is waiting for me as I type this) and moving on to the first volume of his Scary Book series, and all of his epic The Drifting Classroom. Umezu’s work is mostly from the 60s and 70s, and his art style is reminiscent of older anime/manga work like Astro Boy. 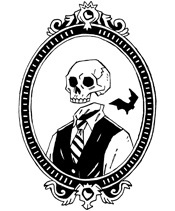 This, and the child-age protagonists, make his occasionally incredibly gruesome stories seem all the stranger. While the Cat-Eyed Boy stuff is a lot of fun, Umezu’s masterpiece is widely considered to be The Drifting Classroom, and I’ve certainly never read anything else quite like it. I initially compared it to a cross between Lost and The Mist, but with elementary school kids. Certainly there’s more to it than that, but it gives you an idea. There’s more than a little Lord of the Flies thrown in as well, and the violence by and against children is as unflinching and gruesome as any you’ll ever see, but it never feels exploitative. It really is a truly amazing series, especially considering it was initially published in the early-to-mid 70s. There’s a particular kind of weirdness in these manga. It’s most prominent in Junji Ito’s stuff, but you can see it a little bit in Kazuo Umezu’s work as well. It’s uniquely Japanese (and to some extent uniquely their own), but it seems to come from the same well as the great weird and cosmic horror of folks like Lovecraft, Hodgson, Machen, etc. (I can definitely see a bit of Hodgson’s House on the Borderland in The Drifting Classroom, for example.) If, like me, this unique weirdness is something that you kind of can’t get enough of, you’ll appreciate knowing that I’ve found a couple of movies that I think kind of capture it. Pre-dating much of the stuff I’ve mentioned here, Matango is a Toho-era adaptation of Hodgson’s weird fungus classic “The Voice in the Night,” complete with amazing rubber-suit mushroom people. It’s remarkably better than you could ever imagine, and has an almost perfect tone of spiraling madness and increasingly psychadelic, otherworldy weirdness. I’ve posted a longer review of it as part of my old column on international horror cinema, which you can read here. Obviously an adaptation of Junji Ito’s manga of the same name, Uzumaki fails to deliver on the same level of genius as its source material, but it comes surprisingly close. Cherry-picking events from across the Uzumaki series, and changing many of them around, it nonetheless gets the very unusual tone of the story down almost perfectly, and is as good a cinematic channeling of Ito’s unique weird energy as I’ve ever seen. Things definitely don’t get nearly as big as they do in the manga here, but the atmosphere is almost exactly right, and the sense of something much bigger than what you’ve seen at the end is very nice.